March has historically been a great month for extreme weather. Both 1983 and 1993 brought monster snowstorms to the east coast stretching from Georgia to Maine. 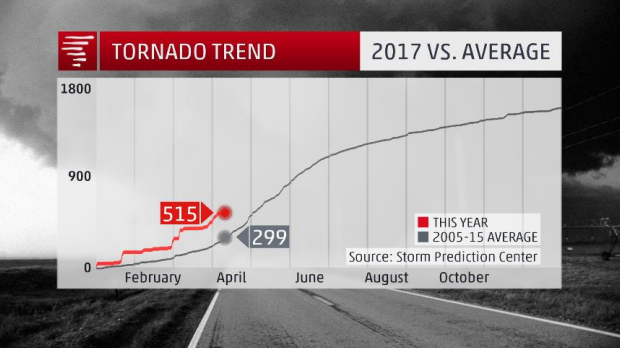 A multitude of tornado outbreaks, including 1942, 2008, and 2012, tore through the Midwest and Southeast. Heatwaves, like that of March 2012, set close to 7,000 temperature records across the US. There was even a category 2 hurricane that roared through the US Virgin Islands back in 1908! Needless to say, if you’re a lover of extreme weather, March can provide everything you need. So, did 2017 hold up to the March madness moniker? Let’s find out. Located smack dab in between Wichita Falls and Dallas is the small Texas town of Bowie. 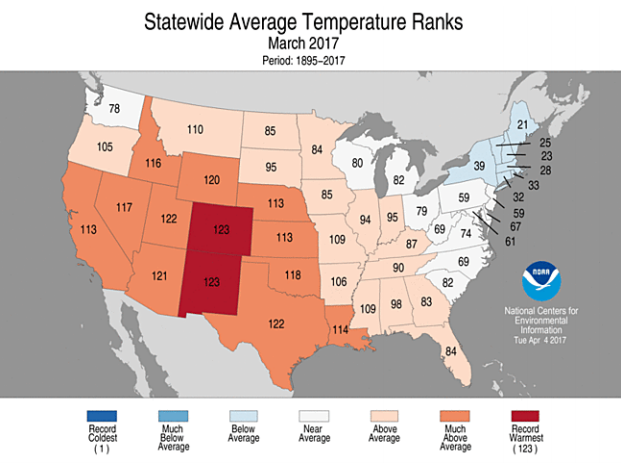 March 2017 would be the city’s warmest March on record at nine degrees above their average. 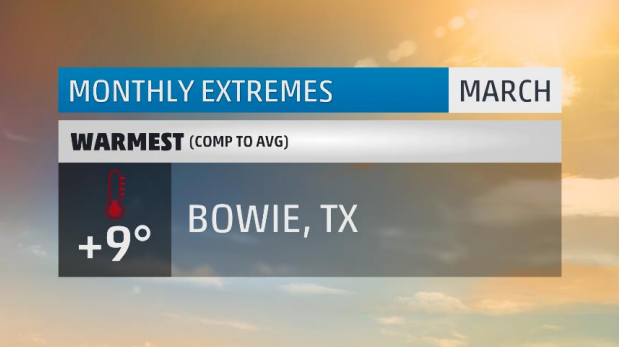 Bowie was one of about 30 places across the US to crack the 90 degree mark during the month of March – and they did it twice. (Any guesses on who saw the greatest amount of 90 degree temps? Make your best guess in the comments below!) Their warmest afternoon clocked in at 92 sweltering degrees. In contrast to the warmth, Bowie dipped below freezing during two mornings at the beginning of the month. All but five days during the month were above average with six days coming in at over 20 degrees above. Ten daily high temperature records were set with another eight daily warm low records (think of it as really warm nights). Then there’s New England. If you wanted any shred of cold weather during the month of March, all you had to do was be northeast bound. It wasn’t brutally cold, as previous Marchs have been, but instead while the rest of the country warmed up, New England stayed persistently on the chilly side. 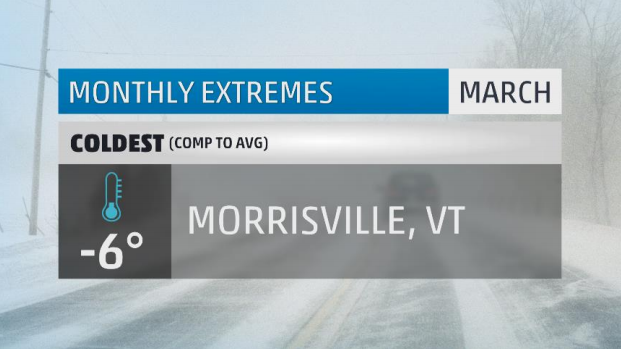 Take for example our coldest spot this month: Morrisville, Vermont. Morrisville started the month with a record breaking 60 degrees. That’s almost 30 degrees above their daily average! Then, just four days later, the mercury failed to reach 10 degrees for an afternoon high. That’s over 20 degrees below their daily average! Twenty-one days of the month were below average with 14 being at least 10 below the mark. In all, this was Morrisville’s second coldest March on record. All of New England was below average on temperatures for the month of March – though none of them cracked their top 20. As you can tell from the map above, it was them against everyone else. Thirty days has September, April, June, and November – and if you lived in Quillayute, Washington, March also had thirty days…of rain! That’s right, out of the 31 days of March, 30 of them had measureable rainfall. And just before you think that one other day was a walk in the park, it too recorded rainfall – but only a trace. Seven separate days saw at least an inch of rainfall while the sun made an appearance on only three days. This was enough to make for their second wettest March on record (they lost by a quarter of an inch). 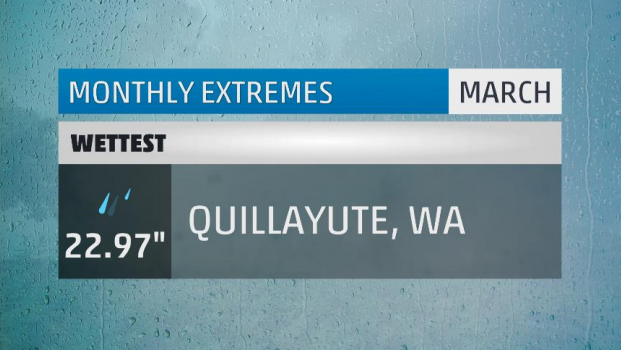 Oh, and by the way, the nearly two feet of rainfall Quillayute had in March is a foot above normal! Elsewhere, heavy rain and strong storms rattled much of the central and southeastern US during March. On the severe weather front, the US is well above normal in terms of strong wind, hail, and tornado reports. As of the time of this article, there have been over 500 reports of tornadoes across the US. That is almost double the average to date. Into the Southeast, drought conditions have worsened as many places had a top 10 driest March on record. 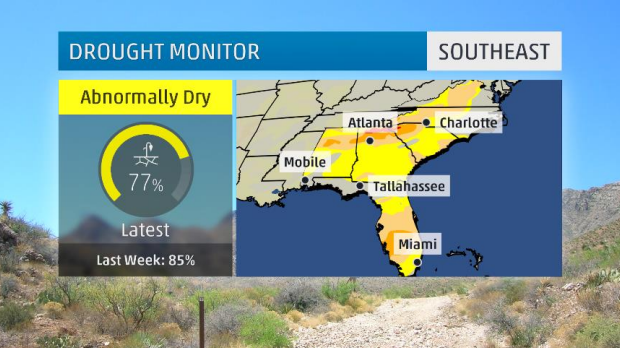 Severe and Extreme drought conditions are currently affecting parts of Alabama, Georgia, Florida, North Carolina and South Carolina. 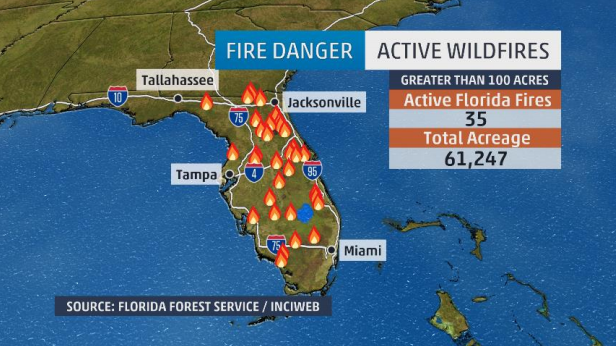 Florida’s drought is responsible for helping set the stage for widespread wildfires. As of this article, more than 30 active wildfires are burning across the Sunshine state. The big March snowmaker this year was Winter Storm Stella. Stella, which hit the northeast between the 12th and 15th of the month, dropped double digit snow totals from Pennsylvania to Maine. For Binghamton, Stella dropped just over 35 inches, and is the snowiest two day stretch in their recorded history. Aside from Stella, there were another eight days of snow in Binghamton, but none of them were more than an inch or so. The close to 40 inches of snow makes for Binghamton’s second snowiest March on record. 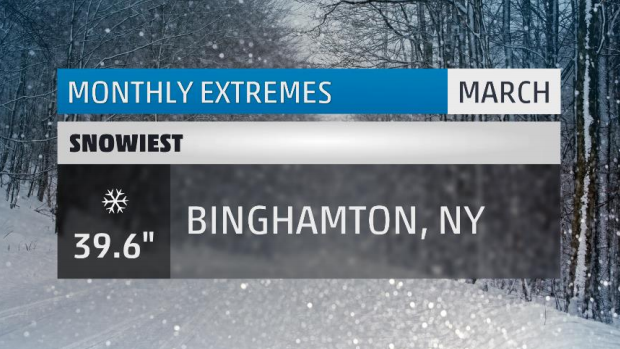 That is in stark contrast to just a year ago where Binghamton only measured one inch during the month of March. Yet somehow, even with all that snow, the official snow depth measurement at the end of the month was zero inches. Oh how quickly the feet melted away. In other news, this is Binghamton’s snowiest “snow season” on record with over 135 inches! Now we head from the snowy, cold landscape of the interior northeast to the desert southwest where sunshine is in abundance and precipitation is hard to find. Thermal is a two and a half hour trip down the 10 from Los Angeles in sunny south California. In March, the skies in Thermal were awfully clear. In fact, of the possible 31 days of the month, 28 of those days were categorized as having zero percent cloud cover. The remaining three days had less than 20% each. That makes for a full month of sunny afternoon and clear, moonlit nights. Thermal was, not surprisingly, devoid of any rainfall for the month, tying 13 other Marchs for driest on record. By the way, their wettest March on record had just two inches of rain. On average, the city sees 270 days of sunshine during the year, making it one of the sunniest locations in the US. But then again, it’s the desert, so I bet you already knew that. On the flip side is Eugene, Oregon, where residents were stuck in the clouds during March. Twenty-four of March’s 31 days were categorized as mostly cloudy. This includes 11 days that were completely overcast. There were zero sunny days (meaning less than 50% sky cover). Twenty-seven days saw measurable rainfall and 22 days has fog or mist that reduced visibility. 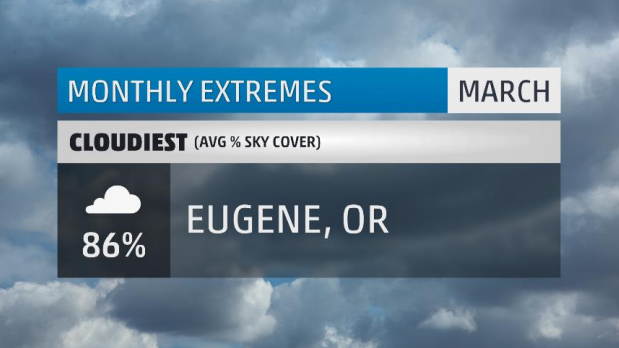 On average, Eugene sees 209 cloudy days per year, making it one of the cloudiest cities in the US. For what it’s worth, Farmer’s Almanac ranked Eugene as the 9th worst weather city in America due to its dreary demeanor. 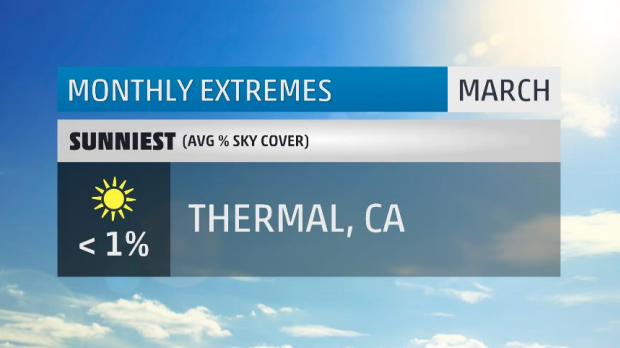 There you have it, the extremes for the month that was March 2017. Make sure to check back next month to see what April has in store. What weather extremes did you face in March? Let me know in the comments below. Good guess! Dallas did hit 90 degrees in March, but only once! Our top spot hit 90 or better 15 times in March!! March 2017 in Camden, Maine: averaged colder than January 2017 . . . for only the 2nd time in 17 years, the temperature failed to reach 50 degrees in March . . . Saturday, March 11th was one of the coldest March days on record. My “official” high was 20, but that was at reset time the night before. After bottoming out at zero around 11am, it never got above 6 degrees all day. Hourly reports from Knox County Regional airport on March 11-12 had 26 consecutive negative-double-digit wind chills, the coldest being -22 degrees at 11am. March is not the month in which we expect to see Arctic Sea Smoke on Penobscot Bay. 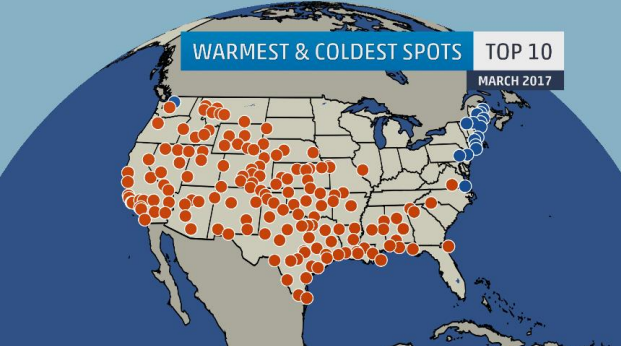 It was definitely an unusual winter for much of the northeast US. Many locations, just like you noted, ended up colder in March than they were in January and February. Now that is something that doesn’t happen very often, or in your case, ever! I know that we had a few high temps of 90s in February but probably March too. Tulsa, OK.
Tulsa was one of the 30 or so places to see a 90 degree temperature in March – but just once – with 92 on the 20th.